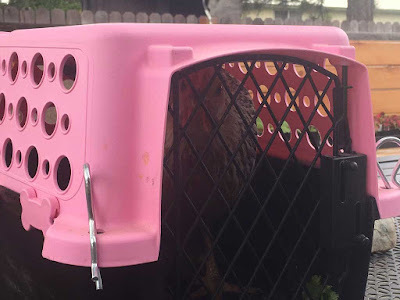 A woman from Spirit Lake, Idaho, who is fighting a ticket she received for failing to restrain a chicken, took the animal to court on Monday. Cindy Tefft says her pet chicken, Grace, apparently escaped her pen, and jumped the fence into her neighbour's yard. “My neighbour said that my chicken trespassed onto her property,” Tefft said. It just so happened to be the yard of a neighbour she says she's had problems with for a number of years. Police cited Tefft for failing to restrain her chicken, so she decided to fight that ticket in court. "I'm confused as to why my chicken didn't get any kind of warnings before I got a ticket," Tefft said. When Tefft decided to fight the ticket in court, she decided to take Grace the chicken along with her. Her only hurdle was getting it past security, so she registered her chicken as a service animal. With Grace security in a pet carrier she made it through security without a problem. There was no clucking in court as Tefft waited to speak to the judge. She didn't get to argue her case just yet, but pleaded not guilty to the ticket against her. Tefft says she plans to take it to court, and will seek legal counsel. She had not decided on Monday whether she would seek her own legal team, or take a public defender. There's no word as to whether Grace will testify in court. What kind of cotton pickin', chicken lickin' two bit police force gives tickets for failing to restrain a hen? I don't know whether it's corruption, vindictiveness or idiocy but I smell a fowl.